The most significant misalignment occurs because LPs don’t pay VCs to do what they say they will — generate returns that exceed the public market. Instead, VCs typically are paid a 2 percent management fee on committed capital and a 20 percent profit-sharing structure (known as “2 and 20”). This pays VCs more for raising bigger funds, and in many cases allows them to lock in high levels of fee-based personal income even when the general partner fails to return investor capital. The solutions to the problem — changing the compensation structure, investing in smaller funds where the partners have also committed at least 5 percent of their own capital, investing directly in startups or alongside funds at later stages, and taking more money out of the over-saturated VC market — are already happening. Look at the widespread trend of angels or smaller funds created by a few investors. Or look at the rise of hedge funds or Digital Sky Technologies’ investing directly in hot companies like Twitter or Facebook at crazy valuations. It’s unclear if other LPs will take the advice issued in this report, but the trends around VC investment these days are fairly clear. There are plenty of firms willing to put small amounts in at an early stage, so they have the option to keep playing if the deal gets hot. And they are just as likely to drop firms quickly around the second (Series B) fundraiser if they aren’t shaping up into a Pinterest or a Spotify. This hit-driven style of investment is a symptom of too much money chasing a new type of startup, and it’s likely that venture investors will compete until much of the return is squeezed out of a hot deal. And that’s no good for limited partners either. The Kauffman report lists the ways it has decided to solve the mismatch between LPs and venture firms, and it goes into a lot of depth on how to improve the industry overall. But if one agrees with the assessment and solutions offered in the report, it also will result in some serious questions about the startup economy. 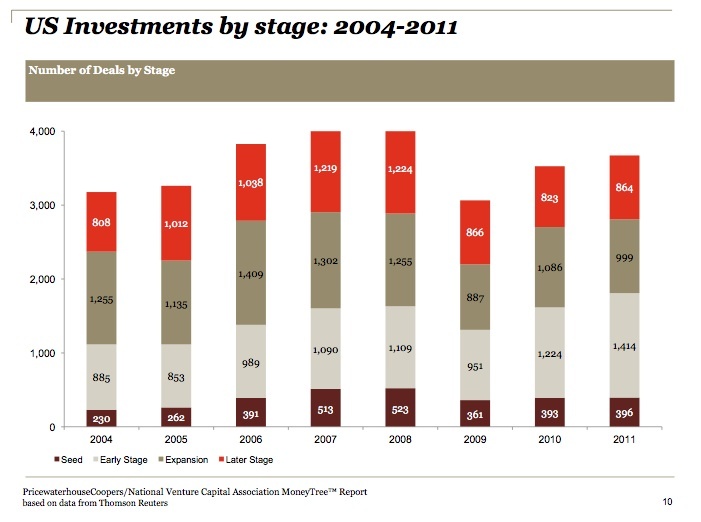 The venture industry invested $28.4 billion into 3,673 deals in 2011, according to the NVCA and the PWC MoneyTree report. About 50 percent of their total investments were in seed and early-stage companies. Does less venture money mean fewer startups? Following the Kauffman Foundation’s suggestions means the pool will shrink. In many ways this is a good thing, as there will be less money chasing the few standout deals, but it also opens the door to thinking about building companies in a connected era. Angels are already picking up some of the VC slack and will likely continue to do so. Once Facebook goes public, I expect we will see a host of newly minted millionaires playing at being an angel or perhaps taking their riches and using it to build something new. For those without soon-to-be-liquid options, Kickstarter and the gold rush promised by the JOBS Act are also likely to fill the gap. So it’s entirely possible the pool of venture capital will shrink while the pool of startups will remain about the same. In such a scenario, VCs, angels and then the rest of us play the role of investor. It’s a role millions already undertake, with Kickstarter’s seeing $200 million pledged and 22,000 projects funded since its founding. And the passage of the JOBS Act means startups can now beg for money among the ranks of friends and family who aren’t accredited investors. I for one am leery of this development, believing it ripe for scams. The law also has the side effect of cloaking information about companies until right before they hit the public markets, which I think is the exact opposite of what a bill that encourages consumer investment ought to do. But still, there will be legitimate companies that will be able to start businesses thanks to the bill. And as lawyers and entrepreneurs get comfortable with the law, new funding platforms should arise. So perhaps the Kauffman Foundation will find itself on the cusp of a trend, from the old-school style of fundraising where an entrepreneur has few choices and has to play by the VC industry’s rules to a crowdsourced and connected era of raising capital that mimics how the Web is changing a variety of businesses. Maybe the VC industry is like Motown. And it’s going to have to adjust to the new reality. Lack of Access: How does the average retail investor get access to the great successful funds? The barriers of entry are too high and conversely the successful funds donâ€™t need capital from the small guy. Lack of Transparency: There is a huge pent up demand to invest in start ups by individual investors. They search and scour for local angel funds, invest their money blindly and hope and pray they are part of a fund that has invested in the next great exit. Not a wise investment strategy. Lack of Liquidity: The retail investor gets invested in the angel fund and then for whatever reason he wishes to cash in or redeem his investment. Dream on again. In most of these angel funds you are buried for years to come. The Solution: The first publicly traded seed stage investment company â€“ DTI Ventures- Democratizing Technology Investment. Investors have access,transparency and most importantly liquidity. I think 2 and 20 is what works well for VC’s but the goal of investment gets surpassed by goal of getting rich to play the role of LP. I’m big supporter of crowdfunding and I believe a lot of financial systems will change in time to accommodate the public opinion on VC’s and LP’s alike. Regardless of the fact how VC’s and LP’s play together, the main objective is a healthy, high potential start-up. And exactly these are growing more and more reluctant to be subject of, how adequately described, this “squeezing”. If start-ups see an opportunity to achieve their goals without being squeezed financially and in their original vision and mission they will go for it. this… regardless the question if it is the best option for the technology development. This is a very astute article on the dysfunctional state of the VC space. It also happens to mirror my thoughts on what is needed to bring the VC industry back into line with reality and to cause not only more but better funding deals to happen. I think there are at least two basic problems with the VC industry: too much capital chasing too few deals, and too much money investing in dotcoms. They don’t call them that any more, but for many people, when they talk about VCs, they talk about people investing in ad-financed web sites. And it’s interesting to see that VC returns peaked in 1997, abut the time when investing in dotcoms started to take off. Investors are being seduced by the dotcoms, because they typically don’t require big investments (like start-ups making physical products), and a handful of them have unbelievable returns. The professional VCs are supposed to know this, but they are just as easily sucked into the “this is going to be the next facebook” fantasy that they forget reality. As for too much capital, that is a symptom of two things: the giant retirement funds of baby boomers (and even the following generation), and the inequitable distribution of wealth and income that has become even more distorted in the last decade. While pension funds and endowments may only invest 5% of their assets in VC funds, that’s still an enormous amount of money. And there are lots of 8-, 9-, and ten digit people out there who have nothing better to do with their money than recycling it (that is a good thing). It would just be better if the VCs returned to investing in companies that develop new technology, and not just new websites. User hate you a liiitttle bit more than they did before when they got to try a feature “product” since they had to go through the whole setup and gave away yet again more personal data. While that works for announcement journalist, funding and the next shiny, articles. In the long run feature companies become acquire hires and the industry comes to a grind, since the acquire hires have no strategic influence on the management of the acquirer. Which then keeps muddling in the intellectual circle they where in before. Until somebody passes the whole mess and obsoletes an industry’s thinking. more money than ideas, so….